ICFJ President Joyce Barnathan leads a panel on the lessons learned from the Ebola crisis. 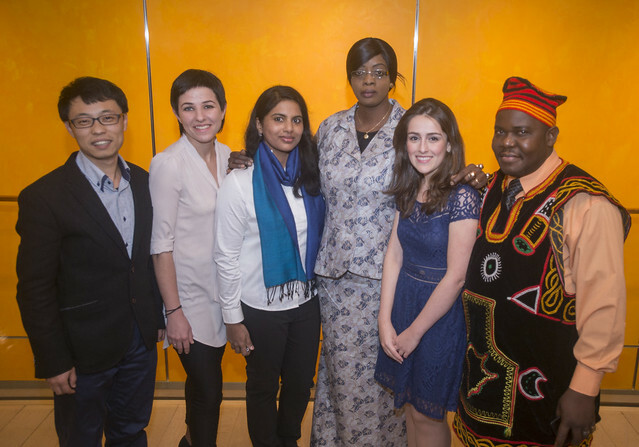 The panel discussion took place at an Awards Dinner in New York City on Dec. 7 to honor six winners of the International Center for Journalists’ 2015 Global Health Reporting Contest, supported by Johnson & Johnson. The three panelists described what went wrong when Ebola first surfaced in the region in March 2014. Panelist Sheri Fink of The New York Times showed a video focusing on the confusion and lack of information surrounding the origins of the epidemic – problems that likely contributed to spread of the disease. Fink, a medical doctor and reporter who was part of The New York Times team that won a Pulitzer Prize for coverage of the Ebola epidemic, learned that health officials at the World Health Organization knew of the problem two and a half months before making a public announcement. That delay likely cost an untold number of lives, she noted. A lack of strong independent news media contributed to the problem in the three countries affected most by Ebola -- Liberia, Guinea and Sierra Leone. In Liberia, many news organizations routinely receive payments to run stories, said Clark, but nobody was paying for Ebola stories. “The lack of media keeping governments accountable contributed to the lack of urgency to stamp Ebola out,” she said. Meanwhile, in the United States, the glut of information disseminated by the news media may have helped to stoke public fear, said Fink. The reports about the disease were often confusing, particularly when it came to the merits of quarantining anyone who had visited the region. "You want to create incentives for countries to be honest about an outbreak,” says The New York Times’ Sheri Fink. On a positive note, Tine De Marez, project leader for an Ebola vaccine clinical trial in Sierra Leone led by Janssen Pharmaceutical Companies of Johnson & Johnson, said her company is making headway in developing a vaccine to prevent future outbreaks. “Once the vaccine is licensed, J&J will work with global stakeholders to make sure it is accessible to those who need it,” she said. She also said the World Health Organization is working on a research-and-development blueprint to minimize the time between an outbreak of disease and rolling out clinical trials to see if treatments work. A key lesson learned was the importance of mobilizing the public in Africa. CDC messages to African communities “don’t have the impact of a traditional leader speaking out,” said Clark. She said the Liberians “turned the corner very quickly” once they understood how to cope with the crisis.” De Marez agreed that building confidence and understanding among local constituents are essential for handling future crises. Encouraging governments to immediately announce cases of Ebola is key. “You want to create incentives for countries to be honest about an outbreak within their borders,” said Fink. Promising to give poor nations the funding and assistance needed if they quickly disclose cases of Ebola could help global health authorities jump on the problem sooner—and limit the casualties. Major challenges still persist, especially in the hardest hit countries in Africa. Hampered by a lack of funding and infrastructure, these nations saw many health workers perish during the outbreak. There’s a great deal more training needed for both health professionals and journalists alike about this devastating disease. “I think there is a lot not known yet about Ebola,” said De Marez. “It’s important for all parties to continue research.” And journalists in both the developed and developing world would benefit from gaining deeper scientific knowledge. The goal is to provide reliable information to the public during a crisis and not cause panic. Homepage slideshow image CC-licensed by Flickr via European Commission.